Saturday’s Grade 3, $250,000 Frank J. De Francis Memorial Dash isn’t just a key late-season sprint. It’s also the fifth and final race of the three-and-up dirt sprint division of the Mid-Atlantic Thoroughbred Championships (MATCH) Series. Fittingly enough the two horses that are currently one-two in the division – and who ran one-two last our in the Polynesian Stakes over the strip – are both slated to face the starter. Yet, assuming no scratches, neither will be the favorite. Laki won the Polynesian via disqualification and leads the division with 24 points. With a win here, he would not only secure the division championship but, with the 35 points he would have following a victory, he would also secure the MATCH Series overall title, leapfrogging sprinting filly Jessica Krupnick (34 points) in the process. Laki is 10-1 on the morning line. Lewisfield, placed second after bumping Laki in the Polynesian, has a total of 19 points. A win here, plus the five-point bonus he would receive for making his fourth start in the series, would give him 34 points, tying him for overall honors. He’s 5-1 on the morning line. Such is life when there’s a quarter-million bucks on the line. The morning line favorite is the Steve Asmussen trainee Switzerland. 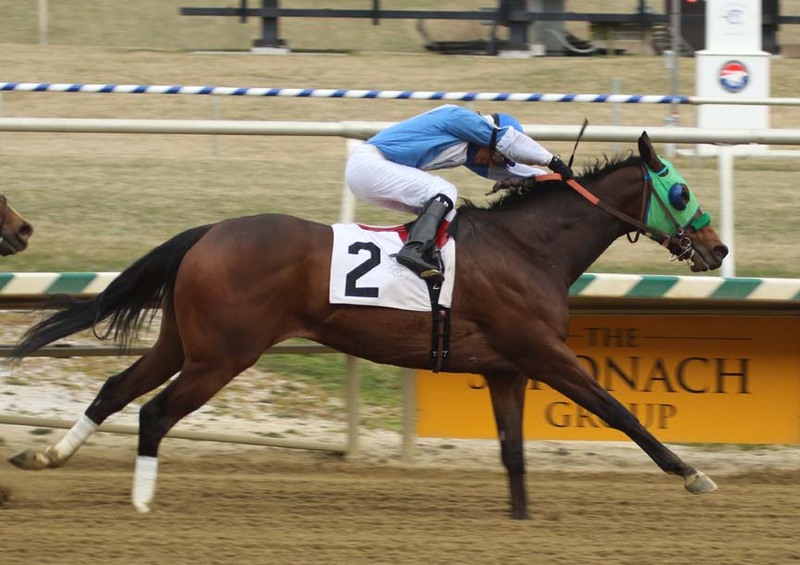 He kicked off the series with a dominant win in the Grade 3 Maryland Sprint Handicap on the Preakness undercard back in May, but he has raced just one time since, a fifth-place finish in the Grade 1 Alfred G. Vanderbilt at Saratoga in late July. Making only his second start in the MATCH Series, he will not be eligible for any bonuses. Switzerland is a slight favorite over Always Sunshine (3-1). The Ned Allard trainee, who won the Maryland Sprint Handicap in 2016 before laboring through a lengthy period of middling performances, enters the De Francis on a two-race win streak. The first of those two scores came in another MATCH Series race, the $75,000 Hockessin Stakes on the Delaware Handicap undercard. He also will not be eligible for MATCH Series bonuses. But back to the MATCH Series runners. Lewisfield, who owns a stellar record locally (four wins and two seconds from six starts) and has never been worse than third in seven six-furlong tries, is showing three works since the August 12 Polynesian, including a bullet three-furlong move September 15, when he zipped the distance in 36 1/5 seconds at his Charles Town base. In the Polynesian, Lewisfield grabbed the early lead, was tackled by Laki at the head of the lane, fell behind that runner, and then battled gamely back to prevail – only to have the victory overturned after the two runners bumped in the lane. “He’s had a few rough trips lately, so hopefully he will have a clean trip in the De Francis,” Runco said. Regular pilot Arnaldo Bocachica, who has ridden Lewisfield to five wins from 11 starts is named, as he has been for every race of his career. Laki was the beneficiary of the stewards’ decision in the Polynesian – “This time I got lucky,” said Damon Dilodovico, Laki’s trainer – and will need to have his running shoes on in the De Francis. He has worked twice since the Polynesian, most recently breezing five furlongs on September 13 in 1:01 2/5. One change Dilodovico made prior to the Polynesian was to name Horacio Karamanos to ride. He has been aboard for all six of Laki’s wins, but Edgar Prado rode in the two races before the Polynesian. Laki, a five-year-old gelding, is a Maryland-bred who is by far the best offspring of Cuba. He runs in the name of owner Buck Kalinowski’s Hillside Equestrian Meadows, a facility in Wolcott, CT.
Laki has run in all four MATCH Series races to date, one of the few horses to have done so. In addition to his win in the Polynesian, Laki also ran third in the Mr. Prospector at Monmouth Park in June and was off the board in both the Hockessin and the Maryland Sprint.